Over the years, I’ve had many opportunities to revisit some of the great locations I’ve photographed. There have been times when a photograph I had envisioned didn’t quite work out for one reason or another—an errant plane leaving a trail across the sky, the moon or the Milky Way being in the wrong part of the sky, or simply me not getting the lighting quite right, or the stars being just a little bit soft. I count myself fortunate to have the chance to reshoot, but I have learned not to expect to be able to recreate the original image, because if one thing is certain, it's that nothing stays the same for long. It could be that the light has changed, a tree has fallen over, or a gate is locked where once it was open. On other occasions, I’ve made a successful image and am simply hoping to make another. Because I teach workshops in national parks and monuments, my students and I are often photographing well-known views in popular locations, and it can be a challenge to make an original photograph. 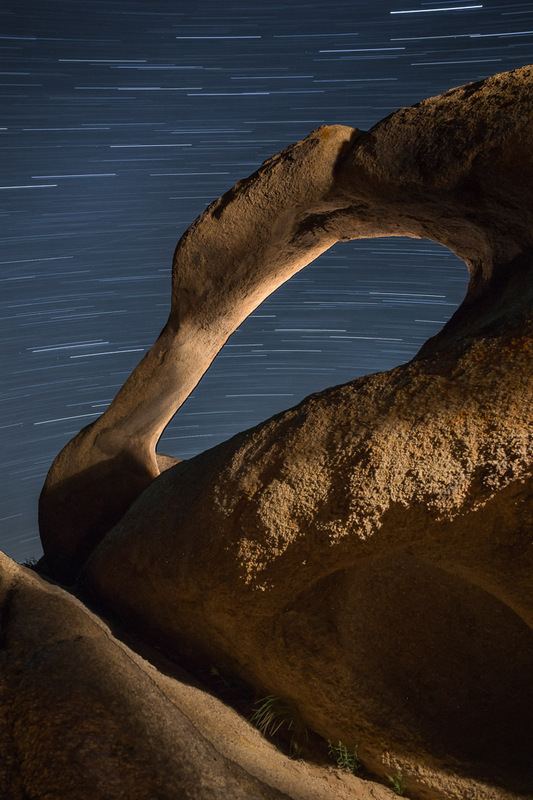 It’s a worthy endeavor to try to make a unique image of Yosemite Valley, the church at Bodie, or of Mobius Arch in the Alabama Hills. I push myself, and encourage my students, to come up with compositions that they have never seen before. ISO 100, 6 minutes, f/8. Canon 5D Mark II, Zuiko 24mm f/2.8 lens. Full moon. ISO 100, 4 minutes, f/8. Canon 5D Mark II, Nikkor 28mm f/3.5 PC lens. Full moon. ISO 200, 30 minutes, f/4,. Canon 6D, Tamron 15-30mm f/2.8 lens. New moon. ISO 12800, 20 seconds f/4. Canon 6D, Tamron 15-30mm f2.8 lens. New moon. ISO 400, 4 seconds, f/4. Canon 6D, Tamron 15-30mm f2.8 lens. New moon, blue hour. Mobius is typically photographed at sunrise, as the arch runs from north to south, and Mt. Whitney can be framed within the arch just as the sun’s first rays light up the Sierra to the west. The most obvious shot is a horizontal one, and that is what most people choose to do. 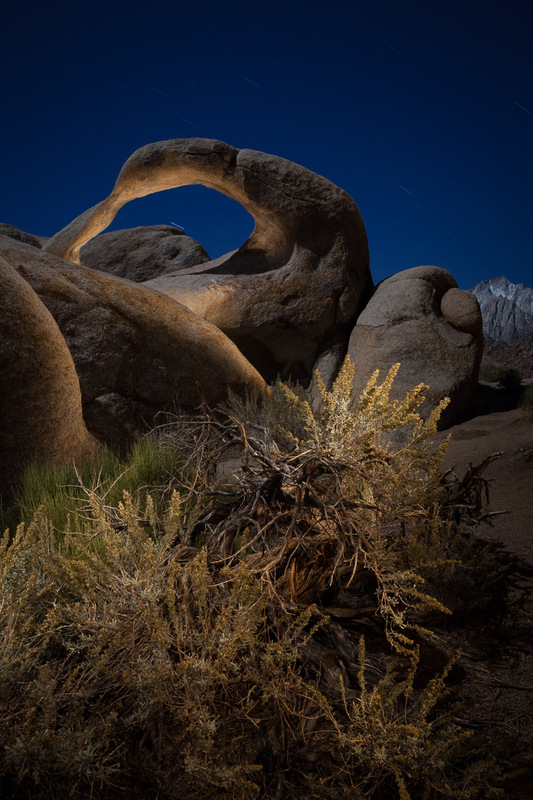 There are plenty of nocturnal versions too, with low moonlight on the Sierra, and the arch in shadow, which provides a great opportunity for light painting. 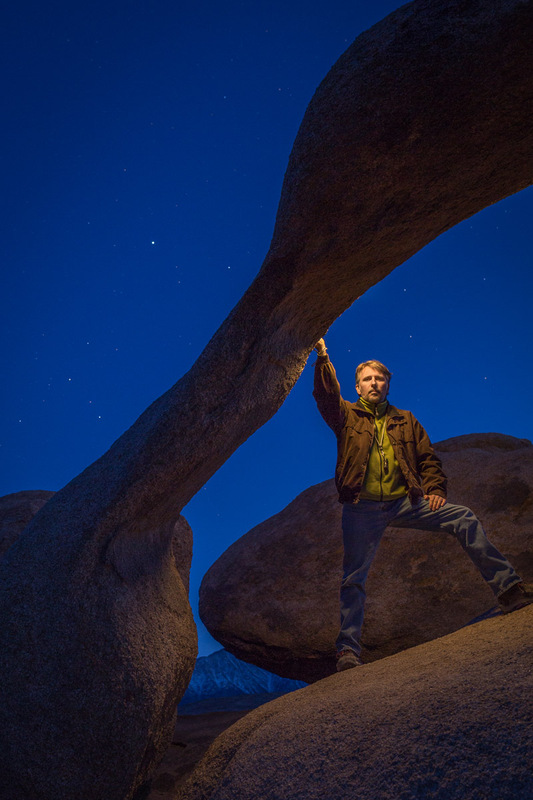 I challenge myself to make at least one unique view of the famous Mobius Arch every time I visit the Alabama Hills, a rocky landscape in the foothills of the Eastern Sierra in California. It’s a way to refine my vision and to stay sharp, and to appreciate how fortunate I am to be able to visit these places on a semiregular basis. In 2007, I was invited by the Texas Photo Society to teach a night photography workshop in Big Bend National Park. The landscape, culture, and geology were all new and exotic to me (coming from Massachusetts) and I was excited to explore. One of the unexpected highlights of the workshop was a visit to Terlingua Ghost Town, a former cinnabar mining town just outside of the park. Mining is always a dangerous occupation, and smelting cinnabar to extract mercury made it doubly so. Terlingua’s miners were mostly Mexican, and many of them died there. The cemetery in Terlingua is a fascinating place to explore, and we were lucky enough to visit during Dia de los Meurtos, when the graves are decorated with sugar skulls, fresh flowers and candles. I made the following image during that workshop, and it was my favorite from the trip. Tres Cruces, Terlingua, 2007. ISO 200, 5 minutes, f/8. Canon 5D, Nikkor 28mm f/3.5 PC lens. Nearly full moon. This image was made with existing light, consisting of moonlight and the orange glow from a candle that was inside the fenced grave in the foreground. I positioned the camera so that the candle was hidden behind one of the fence posts which kept the highlights from being blown out. The candle glow contrasted nicely with the cool blue moonlight, and I felt like the image captured the spirit of the place. I have just come back from another West Texas workshop, this one based entirely in Terlingua Ghost Town and the surrounding area, which is so rich with subject matter. I wanted to see how the graveyard had changed, thinking perhaps that one of the crosses might have fallen over, or at least be leaning over further than it was nine years ago. Much to my surprise, very little had changed aside from the lack of Dia de los Meurtos paraphernalia. What was different was that I was there at the end of the lunar cycle, and the moon was below the horizon. The Big Bend region is the darkest area in the lower 48, so it was truly very dark. One of the workshop students and I decided to do a reshoot of the photograph I had made in 2007. We worked together for about an hour and came up with a dramatic image of nearly the same composition. But the results were very different due to the lack of moonlight, to light painting, and to the partly cloudy sky. I still like the original image, but very much enjoyed the opportunity to revise the location with different eyes. Tres Cruces, Terlingua, 2016. ISO 6400, 30 seconds, f/4.5. Nikon D750, Nikon 24-120mm f/4 lens at 24mm, Coast HP7 flashlight (back-lighting) and Coast HP3 flashlight (fence lighting). New moon.